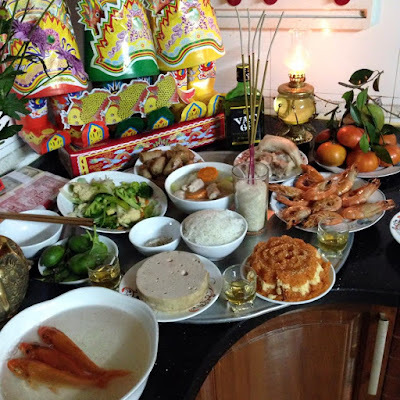 For most Vietnamese, Tet (Lunar New Year festival) has actually begun with the "Ong Cong - Ong Tao" (Land Genie and Kitchen Gods) ceremony on the 23rd of the last month of the lunar year, which falls on January 20 this year. On this day, every family is busy staging a farewell ceremony for the Land Genie and the Kitchen Gods on their yearly visit of Heaven. The Kitchen Gods, the guardian spirit of the kitchen, are believed to comprise two male gods and one female, who bless the household and keep up the kitchen fire, making every member of the family happy and well-off. As the legend goes, the Land Genie and the Kitchen Gods will ride carps to Heaven on the day to deliver an annual report on the household's activities to the God of Heaven. The Jade Emperor, emperor of the heavens, either rewards or punishes a family based on Kitchen God’s yearly report. 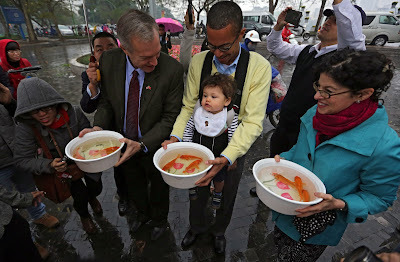 As the gods make their journey on the back of fish, it is traditional to release live carps into lakes or rivers, which is considered a kindhearted deed to pray for good luck. On that day, people also burn paper clothing, including hats, robes and boots, intended for use by the genies on the trip beyond. After the Kitchen Gods go to Heaven, families begin tidying and decorating their houses to usher in the New Year as they believe that a clean house represents a fresh star. On New Year's Eve, both genies will return to earth and resume their caretaking duties in the kitchen of the house. Although residents in each region across the country pay their homage to Ong Cong and Ong Tao in slightly different ways, the gods remain important figures in the rich texture of Vietnamese New Year. The fire in the kitchen is the symbol of not only warm family union, but also a bumper harvest and agricultural development of Vietnamese people. The custom of worshipping the Kitchen Gods reflects Vietnamese's respect of family happiness.